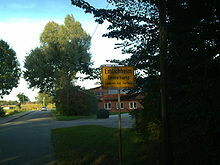 A road sign in Northern Germany, Elmlichheim is the German name, Emelkap the Low Saxon one. Elmlichheim is at the border with the Netherlands, on the German side. Plattdüütsch is spoken by many people across northern Germany. It extended from East Prussia and northern Poland, across northern Germany, the Netherlands, Belgium and to Dunkirk in France. Especially since World War II the name "Low Saxon" has been used in the Netherlands instead of "Low German", and use of the language has shrunk so that it is now only protected in Germany and the Netherlands. Estimates are that there are 3 to 10 million speakers. Most of them have a passive knowledge of the language; there may be about 3 million people who speak it at a good to very good level (or who are native speakers). Mennonite communities use their Plautdietsch everywhere they live, especially in Russia, Ukraine, Central Asia, Germany, South Africa, Malaysia, Indonesia, Australia and the Americas (i.e. the Mennonite colonies in Paraguay, South America, or Chihuahua, Mexico, use Low German as a "co-official language" of the community, in addition to the country's official language, Spanish). Some communities in the Midwestern United States have their own dialects that developed from the dialects of Schleswig-Holstein and Lower Saxony in the 19th century. Nobody knows how many people speak Low German in the United States, and the language may have died out in the mid 20th century. The many German-American communities were further assimilated (mixed) into the English speaking United States and lost many of their traditions, including using Low German and other German dialects/languages. This page was last changed on 12 March 2019, at 12:21.